Hamsters. There, I said it. The Kia Soul is associated with Hamsters, and I can't tell you how many times I heard that when I had this car for the week. But you know what? It's become a well-known vehicle, thanks in part to those hamsters, and to the fact this is a good overall vehicle. 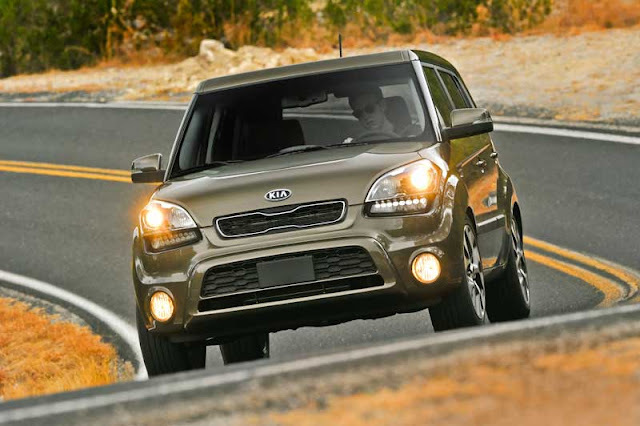 In terms of sales, the Soul has been a very good car for Kia since its debut as a 2010 model. In fact, it's also helped bolster the company's image as hip, fun, and affordable. For 2012, they’ve taken the successes of the earlier models models, added a new engine, transmission, some exterior restyling, and in-car “infotainment”, and improved upon an already successful formula. The ’12 Soul’s shape remains nearly the same as the previous model, with minor changes to the headlamps, front fascia, and taillamps. Our Soul! (aka “Exclaim”) had stylish 18” wheels, and an attractive “Moss” paintjob. It's still funky, fresh, and distinctive. From an interior design standpoint the Soul shines. The interior is modern and attractive. Our test vehicle had a cream/black motif and it worked. We liked the center dash stack, too. 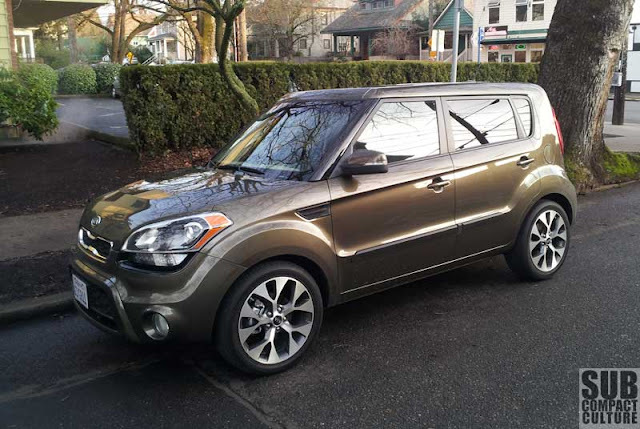 It incorporated Kia’s touch-screen UVO entertainment system, great connectivity, and a wonderful backup camera. And with one of the crispest sound systems around, courtesy of Infinity, the interior rocks out, too. Add to it the well-known door speakers with pulsating multi-color illumination, and you’ve got yourself a mobile night club. (Have no fear—they can be turned off.) 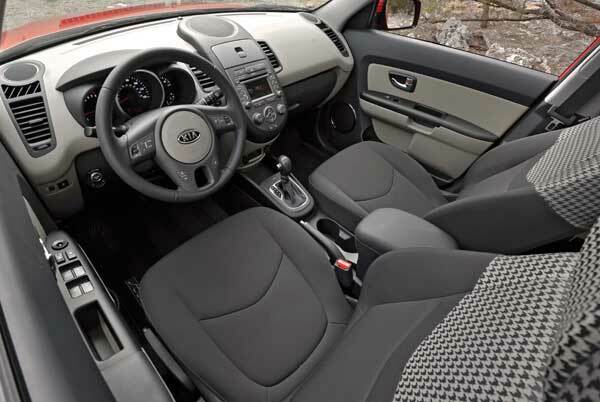 Interior space is generous and the rear cargo area is more than sufficient. The cloth seats, complete with hound’s tooth interior accents, are comfortable, although they could’ve used a bit more support. They were noticeably more comfortable than the seats found on the ’10 Soul Sport I tested back in 2009. The biggest improvement, however, is the new 164 hp. 2.0-liter engine, up from 142 hp. It is mated to the also-new six-speed automatic transmission—two more gears than past Souls—with manual shifting capability. This thing really gets up and goes. I was quite surprised by the amount of thrust. Even with the automatic transmission, the Soul moves out well from all speeds. It is a bit on the noisy side though. There was also a slight vibration in the car at idle. Regardless, it never feels underpowered. Our Soul Exclaim rode softly and comfortably, and cornered similarly. While not track star in the corners, the ride is admirable. Whereas the ’10 Kia Soul Sport we previously tested rode stiffly but cornered precisely, the Exclaim is more agreeable, especially on the highway but loses some of its quick moves. By the way, there is no more Sport model for ’12. So we’ve got more power, more comfort, and even more fuel economy. Our Soul was EPA rated at 26 MPG city, 34 MPG highway, which is another improvement over the previous model years. Really, there is a lot to like with the Soul’s latest update. The price of our Soul Exclaim test vehicle was $20,350, including destination, which is up about $2,000 from the ’10 Sport we tested. 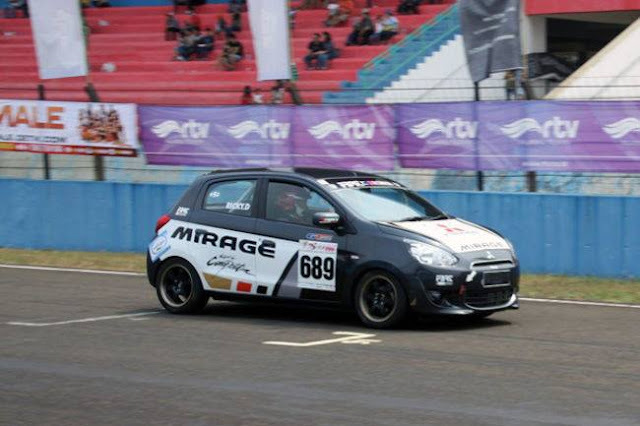 That is on par with competitors, such as the Nissan Cube and Scion xB. You can top it off with Kia’s outstanding warranty, too. You definitely won't have to sell your soul for a Soul. 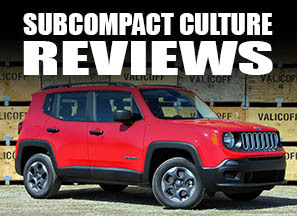 It’s a good car that still has plenty of personality, and lots to offer. And the hamsters. Did we mention the hamsters? I've been looking into new car models including the Kia. 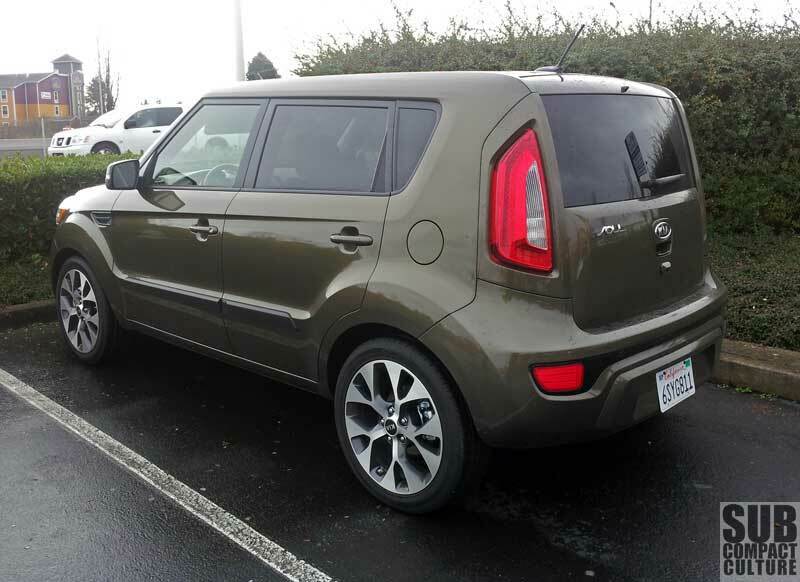 Although I usually wouldn't go for a fun looking car such as this Kia Soul, there is something about it that draws me in. I've seen quite a few of these in the streets and looking like a good size for a family of four. Perhaps its time to look for a Kia dealer and give the car a try. The front driving/fog lights are ralley car sized now, LED row lights under the headlights like high end cars, more body colored accents instead of black plastic, the rear tailights are all brite red LED rows, led yellow turn signals, bigger bumper relectors (in europe and asian countries they're low mounted turn signals of reaf fog lights), headlight are now ultra bright "projector" lights, powered folding mirrors standard on the Exclaim, etc. And the Infinity Boom box and UVO system has to be experienced!